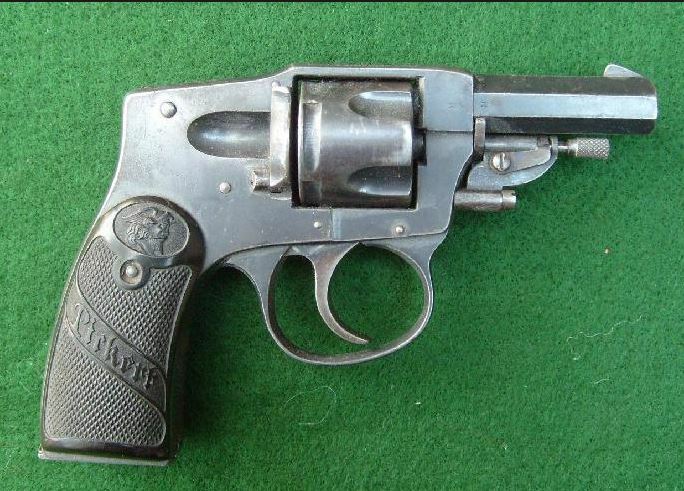 Speculation: this Arminius “Pirkert” .32 caliber revolver, Germany, 1920s, might have been the kind of gun my father bought before the Nazis took over Germany in 1933. 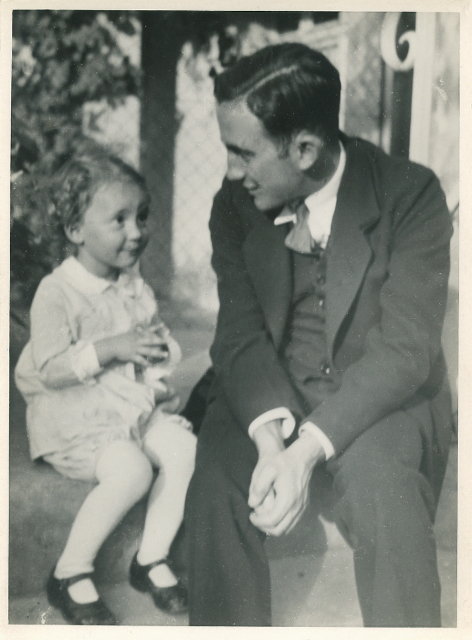 When the Nazis took control of the city of Mannheim in March 1933, they arrested the top Social Democratic leaders in the city government, including my father, Johannes Höber. They kept him in what they called “protective custody” for five weeks, as previously narrated on this website here. In the months before the takeover, Johannes had been involved in the militia arm of the pro-democracy coalition Reichsbanner Schwarz-Rot-Gold. I previously wrote about that anti-Nazi paramilitary force here. As part of his involvement in the activities of the Reichsbanner, Johannes bought a pistol that he took on forays with other Social Democrats to disrupt Nazi meetings. My father was a little guy and descended from a well-to-do family of serious intellectuals and scientists. He never seemed to me the kind of man who would engage in this kind of reckless activity, but my mother’s head-shaking bewilderment when she told me about it made it clear the story was true. Johannes Höber with his daughter, Susanne, around the time he bought his pistol. In this picture he doesn’t look much like a candidate for an armed anti-Nazi militia. My mother, Elfriede Höber, was a committed pacifist and disapproved of my father’s heroics with the Reichsbanner and especially disliked his keeping a gun in the house. Even decades later, in America, there was a notable tension between them on the one or two occasions when the story came up. Elfriede Höber around the time the Nazis arrested Johannes. When Johannes was jailed by the Nazis, Elfriede was left at home alone with their little girl, Susanne, then 3. The pistol was hidden in a stack of bed sheets in the linen closet of their apartment. In the early days of the new regime, no one knew what to expect of the Nazis, but Elfriede feared they might come and search the house for contraband after Johannes’ arrest. Terrified that the Nazis would consider the gun proof that Johannes was an enemy of the regime, Elfriede decided she must get rid of it. But how? The solution that came to her was the bridge across the Rhine River, which had been rebuilt and dedicated in a ceremony just a few months earlier. 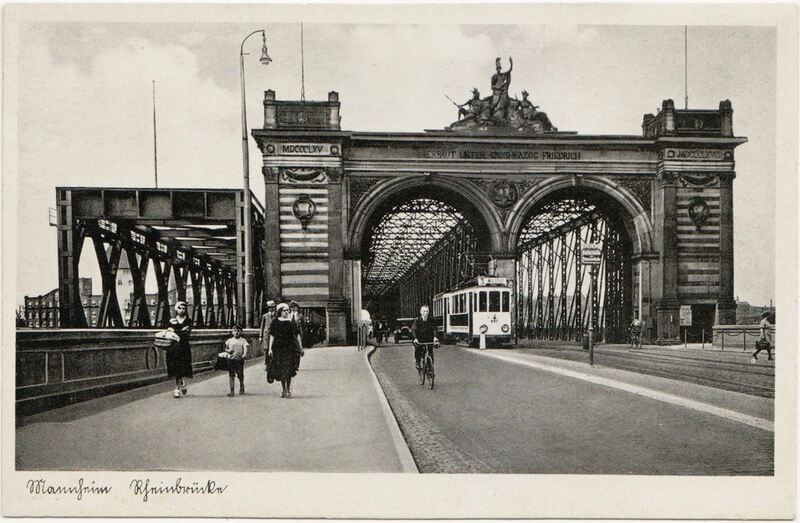 The bridge over the Rhine at Mannheim around 1934. Elfriede probably used the walkway at the far right to carry Johannes’ pistol onto the bridge. To support her, Elfriede asked her best friend, Marianne Daniels, to go with her to get rid of Johannes’ gun. The two young women retrieved the pistol from its hiding place in the linen closet and placed it in a plain paper bag. At night, the two walked out into the dark city, anxious that they might be stopped by a roving squad of storm troopers. After walking for half an hour along the bank of the Rhine, however, they reached the dark bridge unmolested. Hearts pounding, they walked out to the middle of the span and dropped the bag with the gun over the railing. It disappeared into the black waters of the Rhine. For the moment, that peril was out of the picture. Postscript: Readers of this blog may remember that my dear friend Achim in Dresden has shown astonishing skill in recovering rare items related to my family’s history. This year Achim found an extremely rare copy of the program from the ceremony on November 19, 1932 dedicating the newly reconstructed bridge at Mannheim, where Elfriede later got rid of the pistol. 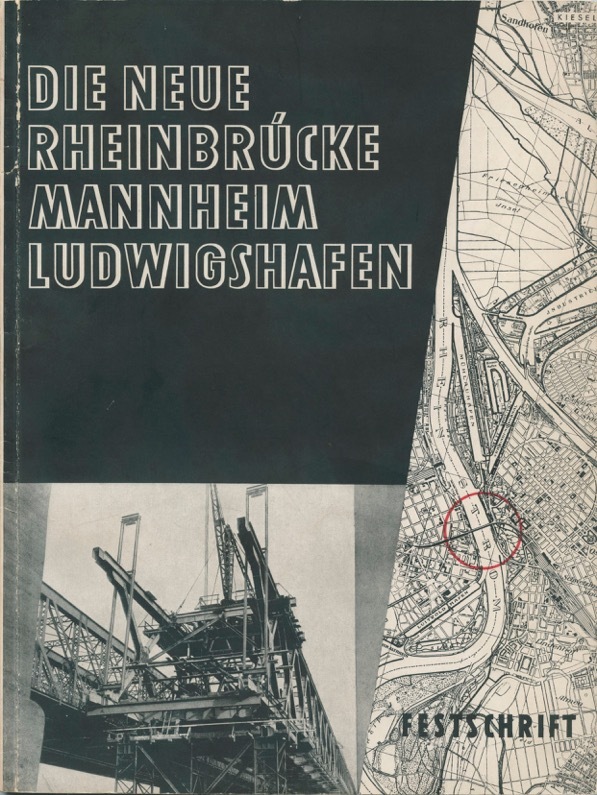 The program book was produced by the Press Office of the City of Mannheim, which Johannes headed at the time. Program for the dedication of the new bridge across the Rhine at Mannheim, November 19, 1932. The lapel pin pictured above was worn by those who supported democracy and representative government in Germany before 1933. With the defeat of Kaiser Wilhelm’s forces at the end of World War I in 1918, Germany became a parliamentary democracy for the first time. Not everyone supported the Weimar Republic, however, which was subject to continuous attacks from both the left and the right. In 1923, there were two failed coups, one on the left by the Communists in Hamburg and another by the Nazis on the right in the attempted Beer Hall Putsch in Munich. In response to these attacks, the Social Democrats and centrist parties formed a non-partisan organization devoted to protecting the Republic. They called the organization Reichsbanner Schwarz-Rot-Gold , or Black, Red and Gold National Flag, the colors of the flag of the democratic Republic. There was a civilian political wing of the Reichsbanner as well as a paramilitary wing. The latter was able to provide resistance to the Stahlhelm (Steel Helmet) of the aristocrats and military, the Sturmabteilung (SA or Stormtroopers) of the National Socialists and the Rotfrontkämpferbund (Red Front Fighters Brigade) of the Communist Party. Both my grandfather Rudolf Höber , a Liberal, and my father Johannes, a Social Democrat, became members of the Reichsbanner. They undoubtedly wore the pin of the organization, publicly declaring their support for democracy and against dictatorship. My father later became a member of the paramilitary wing and was more than once involved in violent conflicts with Nazis in the months before they took over the government. After the Nazis were given control of Germany in January 1933, the Reichsbanner was quickly suppressed and past membership became a basis for persecution. My grandfather’s membership in the Reichsbanner was one reason cited by the Nazis in expelling him from his position as Professor of Physiology at the University of Kiel. My father was dismissed from his job in the government of the city of Mannheim and arrested. With experiences like these, all evidence of the Reichsbanner quickly vanished. Although there had been hundreds of thousands of members in 1931 and 1932, anyone associated with the organization quickly divested themselves of any evidence of their membership, including their membership pins. As a result, the pins, these symbols of freedom and democracy, nearly disappeared. But I have one. My Dresden friend Achim, who has appeared in these posts several times, is a researcher and archivist of exceptional skill. He recently found one of the few surviving Reichsbanner pins, 80 years after the organization was crushed by the Nazis. Knowing that I would value this memento more than almost anyone, Achim sent it to me for Christmas. It is a rare gift in every sense.